Good student housing.submitted by Valentino A. - Mar 06, 2019 |Recommended: YesLiving at Millennium is nice, facilities such as the fitness center are good. The walls are quite thin, and the fee to park in the garage is entirely too high in my opinion. Good, but....submitted by Kori M. - Mar 01, 2019 |Recommended: YesI like the apartment complex overall. The rooms are well set up, I feel really safe here and I enjoy all the amenities and parking garage. Everything being inside is amazing when it’s 22 degrees outside, but we have had trouble with maintenance coming in when we aren’t home and not leaving us notes as to why they came in, which I do not like the maintenance team are very nice and will talk to you when you are home, they get things done rather quickly as well. But I am just not a fan of someone coming into the apartment without anyone knowing, moving our stuff, and then not telling us why.. there has been multiple times where I thought someone broke in but nothing was stolen rather just moved.. but that’s just a little thing, my main concern is with their pest control team. We have called their pest control guy Multiple times trying to get him her to come spray and it has yet to happen. We have found 4 roaches since the beginning of the year, and we are a relatively clean apartment the roaches are coming out from the plumbing, there was also a problem with fleas out of the two extra bedrooms, we ended up having to take care of the problem ourselves, after two weeks of no one showing up. Even though we had called them personally, told maintenance and he called, and telling the office and they called, yet somehow they didn’t get the message or just ignored it. Great place.submitted by Gustavo G. - Feb 11, 2019 |Recommended: YesThey like to do stuff for the people living there and that is a great plus I have not had a bad experience there within the last 3 years living there. Loving it heresubmitted by Dylan M. - Jan 18, 2019 |Recommended: YesLove the hot tub, lots of fun events to build community. Any issues are addressed quickly. I think its a nice property that needs better security and maintenancesubmitted by Claire M. - Dec 31, 2018 |Recommended: YesI really like the property and the rooms. Rent is a bit expensive but it really is a nice apartment so I'm willing to pay it. Some times it gets loud and gross but that's part of living in a student apartment. The management seems like they want to help but sometimes they are understaffed. The parking garage is a safety hazard and I'm surprised there aren't more accidents. Good for pricesubmitted by Rachel H. - Dec 04, 2018 |Recommended: YesFire alarms are a mess... always checking them or they're going off on their own. Management is TERRIBLE at communication, so if you need to talk to them, you have to go to the office and speak to the landlord if he's even there because the people in front can't answer your questions. That being said, it's not that expensive to live and my personal apartment has had very very few problems. It is beautiful but has tiny flawssubmitted by Cassidy R. - Dec 03, 2018 |Recommended: YesIt's good, but the fire alarms are very sensitive. Beautiful property, but frequent maintanence issues fire alarms, clogged toilets, mirrors in the parking garage.submitted by Rachael M. - Nov 27, 2018 |Recommended: YesIt is nice living in Millennium, the gym and pool is super convenient as well as the study areas but there are small things that do not go unnoticed that are a little annoying. The toilets in the gym have been clogged more than once, there is never toilet paper in those restrooms as well, the fire alarms continuously go off, as well as the coffee machine in the shared kitchen area does not regularly produce coffee. Very friendly and always trying to get better.submitted by Jonathan F. - Nov 27, 2018 |Recommended: YesI would say it's a very friendly, calming environment. Also, this property is very, very safe with the fact its a gated community. Also, this community is always doing weekly events to keep it's residents occupied and happy. The property is amazing and very home feeling. But not with cleaniness .submitted by David C. - Nov 14, 2018 |Recommended: NoI first moved into my apartment without it being clean and sanitary. the carpets smelled got awful. You can tell their were pets living in the apartment and had urinated in the bedroom carpets. Other then the poor care, the location and living is clam and relaxing. 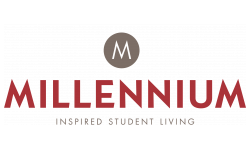 It's a great property for the price, but bad tenantssubmitted by Samuel W. - Nov 09, 2018 |Recommended: YesOverall I have been very satisfied with Millennium lately. The price is pretty low, there are great amenities and community activities, and the Ethernet is INSANELY fast. The only real problems are that the walls are a bit thin, at least from room to room in the apartment definitely was worse when I lived in building 2, rather than 1 and some of the tenants do not know how to clean up after themselves. The gym is constantly a mess with weights, medicine balls, etc. scattered to the winds and people leave dog poop all over the place. Of course, this is a complex intended for students so it will happen, I don't blame the management. It's just annoying. The furniture is not high end, but is sturdy, functional, and in my opinion decent looking, which is all I really need in order to be happy with it. The landscaping is again the tenants fault and it would be unrealistic to expect workers to be constantly cleaning up after people. Otherwise the staff do a wonderful job of maintaining a great look outside. Again let me praise the Ethernet. I'm not sure about the wifi, but after the recent upgrades it hasn't let me down. The Ethernet, however, holy smokes. My download speed has peaked at over 95 MB s. That's not 95 Mb s, full MB. It took me about 15 minutes to download a 60-some GB file yesterday at peak usage hours. This has changed my life. Thank you so much for this Millennium management.